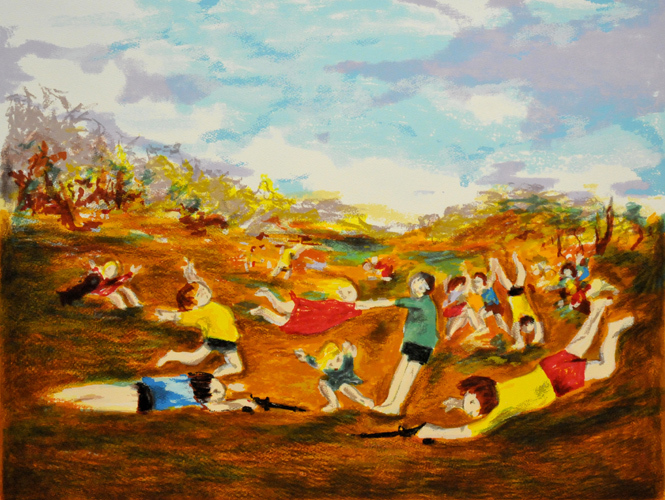 This is a limited edition Silk Screen release by David Boyd titled Games, David Boyd in some cases titled some of the edition also War Games. The edition is limited to 75 only and is selling fast, done on Velin Archers paper sized 75x105cm with the image size being 59×77.5 cm makes it very vibrant and colourful, excellent when framed. David Boyd chose to do this work in a silk-screen using a difficult Bitumen and Gum acacia process to try and achieve a painting type of finish, very well done and in a real David Boyd Style. This Silkscreen is a unique piece showing Davids Boyds signature use of colour. Lay By payment plan up to 12 months is available.